I often get parents of small kids over for a visit, and they gush about how they wish they could have their kids grow up here. YES. It has some amazing advantages: culture, history, cool accents. I love the childhood my children have most every day of the week, but I also feel like I always need to be honest. (Because trust me, I glazed over city living with kids for a long time... before I actually lived with kids in a city.) The fact of the matter is that living in a major city with a young family comes with some huge downfalls: no space (seriously, like ever), long journeys of schlepping in bad weather or on crowded transport, somewhat difficult social boundaries to break through. We have been really lucky and are so grateful for our little life here. We have all our needs met... and beyond! But last summer, we were feeling a bit claustrophobic. Tyler finally broke down, jumped through the hoops to get his UK license and we added a (very used! very cheap!) car to our family after 7 years of living without it. We hardly use it still walk and scoot most places during the week. But on the weekend, we get a little crazy and get the itch to get out of town with the kids and give them room to explore. For Edie's birthday, we wanted to do something simple. Since those first few birthdays are really for the parents, these parents decided that the best thing for us was to go easy on ourselves. So, when an extravagant party isn't an option, hanging out in a pretty place is the next best thing because it still feel really special. We headed to Richmond, parked the car, unloaded the kids and went down towards the river. Along the Thames there is the cutest little river walk- which is just a small part of the the Thames Path National trail that stretches 180 miles from Greenwich to north of Oxford. 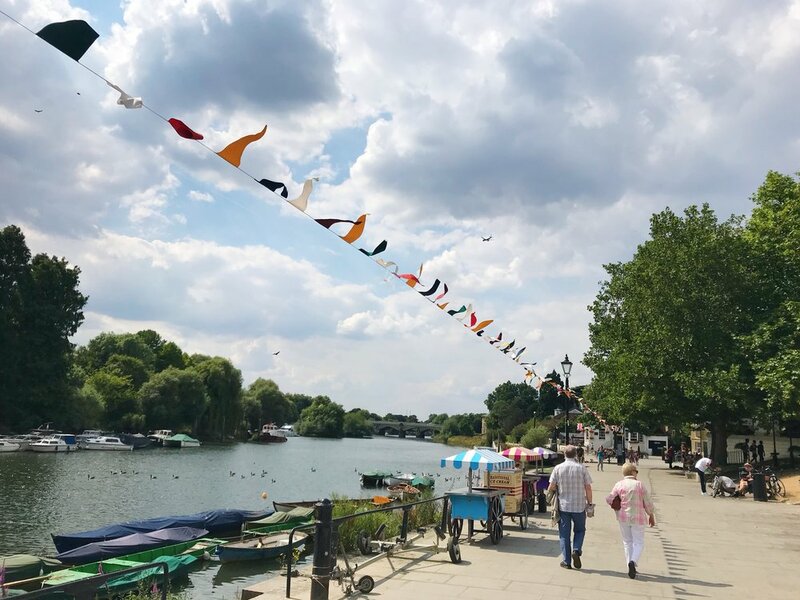 The place we went to stretches between Richmond and Hampton Court and comes complete with boat & bike rentals, cafes with people dotted around the tables, grassy areas with people napping or lounging together, and cute little bunting to guide you along the way. We LOVED it! We found a little spot, tossed down our picnic blanket, lit a candle on a cupcake and sang happy birthday to sweet Edie. After they gobbled down the icing and abandoned the cake part of the cupcakes, we watched Harrison scoot up and down a long ramp until we could no longer stand the heat. It was a perfect little escape from the crammed city routine we often do, and I can't wait to go back and do more picnics... and, when Tyler's feeling up for some arm work, going in one of the row boats. You can easily reach Richmond by car or public transport (trains from Waterloo into Richmond or the district line to Richmond). There was some nice detailed instructions on this site. But basically, just get to the High Street in Richmond, and you're just a street or two away. 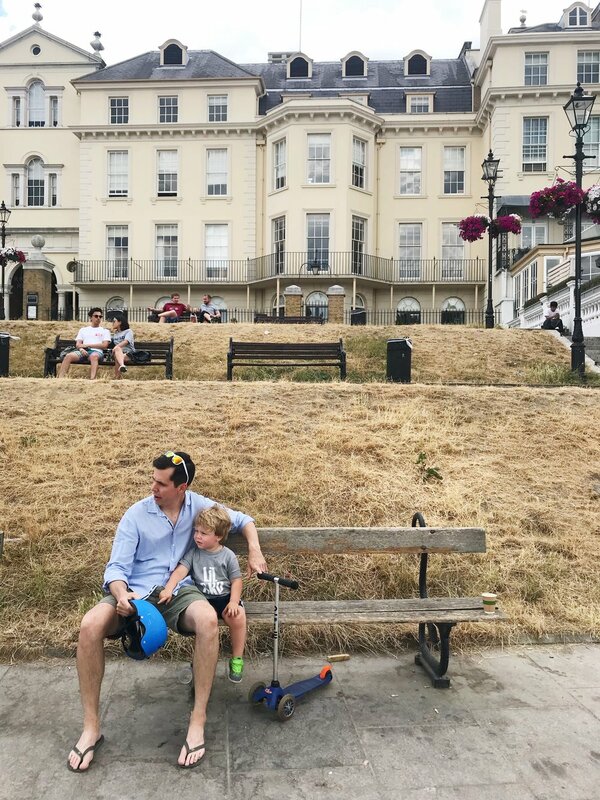 This is a great day out and makes those tough stretches of being in London with kids feel less stressful and so, so lovely! LOOKING FOR MORE ABOUT LONDON WITH LITTLE KIDS? CHECK HERE.